GFA's Ella Murphy, a resident of Darien, scored her team's lone goal this week in a road loss to The Gunnery School. The 2017 fall sports regular season all but came to a close last week with all of the Greens Farms Academy teams qualifying for postseason play. The FAA cross country championships were held on Tuesday while the FAA playoffs for boys and girls soccer, volleyball and field hockey will begin this week. It was a breezy day with blue skies and it combined for a very fast 3.1-mile course at Waveny Park in New Canaan for the FAA cross country championships. The Dragons placed fifth on the boys ledger while the girls took seventh out of eight teams. The GFA girls, who finished all five of the runners for only the second time this season, were led by freshman Caroline McCall (Westport), who finished 11th overall (21:46), earning All-FAA honorable mention. Junior Katherine Marcus (New Canaan) was 40th overall at 25:04, and sophomore Bella Worrell (Westport) finished 44th (25:53). Forty-nine total varsity boys crossed the finish line. The top four GFA runners all finished in the top 30, including senior Connor Calzone (Norwalk), who was 21st in 19:12; sophomore Owen Minson (Darien), was 23rd in 19:29); senior Sean Minson (Darien) was 26th; and sophomore Charlie Bohnsack (Darien) was 28th (20:11). The Dragons ended the regular season with a 3-0 win over EF Academy by the scores of 25-8, 25-14, 25-15. The win was GFA’s fourth straight to end the season and helped the Dragons clinch a winning regular season at 10-8. The celebrated senior day for our five seniors Celeste Matte (Stratford), Ilillta Pina (Weston), Hannah Kozdeba (Shelton), Kendall Roche (Darien) and Alex Wagner (Southport). Wagner (4 kills, 6 aces) and Roche (5 kills, 1 ace) helped lead a strong offense that had nine players register kills. Defensively Matte (6 digs), Kozdeba (5 digs) and Pina (5 digs) led a tight defensive unit that had great saves and accurate passing that kept the offense flowing. The boys varsity soccer team capped off a 12-3-4 season by defeating visiting Forman 5-3 on Senior Day. Senior Jake Sinnott (Fairfield) scored twice in the first 15 minutes, both assisted by senior Ian Lee (Greenwich). Sophomore Liam Murphy (Westport) followed with GFA’s third goal, assisted by Miles Mcdonald (Westport) before senior captain Henry Holzinger (Westport) added GFA’s fourth just prior to halftime. Senior Jack Soper (Southport) notched GFA’s fifth goal just after the break with an assist from junior Ethan Phan (Bridgeport). Forman scored three goals late in the game to make the final 5-3. Seniors Nick Attai (Bridgeport), Jackson Bolbool (Greenwich), Henry Brennan (Darien), Henry Coroon (Westport), Drew Durkin (Darien), Steffen Refvik (Westport), Brian Schnabel (Greenwich), Griffin Segalla (Stamford), along with junior Will McCall (Westport), sophomore Charlie Benson (Darien), and freshmen Aidan Murphy (Darien) and Max Yates (Fairfield). 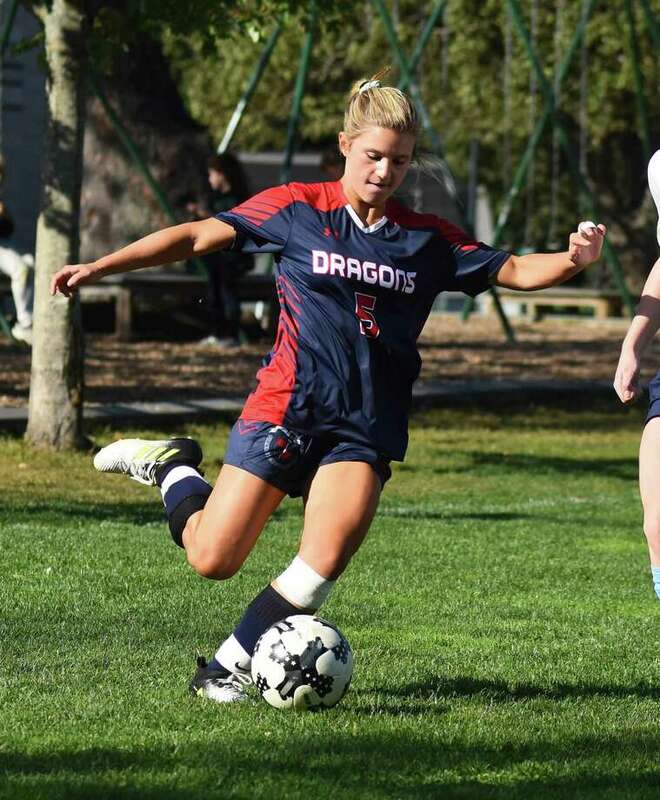 Ella Murphy (Darien) scored off an assist from Elyse Kimball (Easton), but it was the only tally the Dragons could manage despite outshooting The Gunnery by a 19-7 count and falling by a 3-1 score. The game was tied 1-1 the half, but The Gunnery put away two second-half goals to notch the win. Marygrace DelliSanti (Wilton) had three saves for the Dragons. After its FAA playoff run this week, GFA (6-8-4) will play one more non-conference regular season game at Miss Porter’s School this coming Saturday. Forced to celebrate its Senior Day on the road after weather cancelled its last home game of the season, the Greens Farms Academy field hockey team went to Hamden Hall on Wednesday and suffered a 4-1 loss. The Dragons found themselves unexpectedly on a grass field as the Hornets jump out on top to a 4-0 halftime lead. Keely O’Shea (Darien) scored for GFA in the second half. Nikki Farber (Westport) made eight saves in the first half while Rikeh Saignbe (Bridgeport) stopped four shots in a scoreless second half. Hamden Hall out-shot GFA 18-10 despite the fact that the Dragons had a 21-10 edge in penalty corners. Later in the week, GFA held the edge in shots and corners, but just fell a goal shy of wrapping up its regular season with a win, falling to Kingswood Oxford by a 2-1 score. After KO jumped on top 1-0 early, GFA answered when Laila Pina (Weston) tied the game on a breakaway. KO had a few breakaway opportunities of its own that GFA stifled quite a bit thanks to defense by by Alex Nesi (Fairfield), Ryan Morris (Stamford) and Lucy Holzinger (Westport). GFA was also led offensively by Holzinger who took it upon herself to help earn GFA 12 penalty corners. Again, though, GFA couldn’t quite finish their plays in the circle with numerous shot opportunities from O’Shea, Holzinger, Fran DeVita (Darien), and Pina. GFA had a 12-10 edge in shots and a 12-7 advantage in corners. Farber and Saingbe combined to make seven saves. GFA will take a 6-9 record into its first FAA playoff appearance in years. The Dragons will then wrap up the season on Saturday, Nov. 11, at the Ethel Walker School.